The Ordovician Period began about 485 million years ago and ran up until about 440 million years ago. This period was defined by Charles Lapworth in 1879 and named after a Celtic tribe called the Ordovices. Charles Lapworth defined this period because the followers of two of his colleagues were disputing in which strata some rock beds in northern Wales belonged. Followers of Adam Sedgwick believed they belonged in the Cambrian Period and followers of Roderick Murchison believed they belonged in the Silurian Period. Lapworth, however, believed it belonged in its own period between these two and therefore, defined this period. 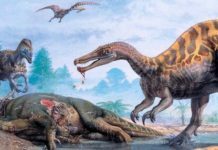 However, it wouldn’t become officially recognized until 1960 when it was adopted as an official period by the International Geological Congress. 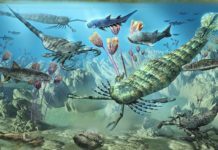 During the Ordovician Period, life continued to evolve and become increasingly complex. 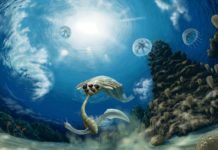 Organisms formed communities that were more and more intricate and food chains gained a complexity that far surpassed the food chains of the Cambrian Period. There was also sort of an Ordovician Explosion of life, although it hasn’t gotten as much media attention as the Cambrian Explosion. During this time, marine fauna genera increased by a factor of four and trilobites became an extremely diverse species. It was also during this that reef-forming coral started appearing. Mollusks were another group of marine animals that increased their number and variety during this time. A number of different mollusks came into prominence and these included bivalves, nautiloid cephalopods, and gastropods. During this time, the first jawed fish began to make an appearance, as did the first true star fish. Scientists also believe that the first land plants made their appearance during this time. 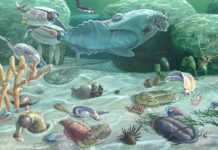 While trilobite based ecosystems dominated the oceans early on during this period, this ecosystem was gradually replaced by a more mixed one. 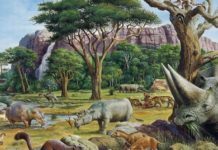 An ecosystem in which a variety of different organisms thrived. Organisms which include mollusks, bryozoans, brachiopods, and echinoderms. However, trilobite communities didn’t remain stagnate during this time, trilobites continued to evolve. They developed attributes which made them more successful in their environment. Adaptations which include head shields, or spiny nodules to use to defend themselves against predators. 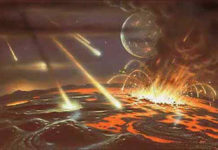 This period came to an end with a series of extinction events that mark the boundary between the Ordovician and the Silurian Periods. These occurred between 447 million and 444 million years. During this time, about half of all fauna genera would disappear and many groups were greatly reduced included trilobites, brachiopods, and bryozoans.